As it turns out, the data recently provided by V-Dem has something to say about this. V-Dem’s data also extends all the way back to 1900, but for the sake of precision (and relevance) I’ll start the series in 1950, with the election of Menderes and his Democrat Party, to the government. 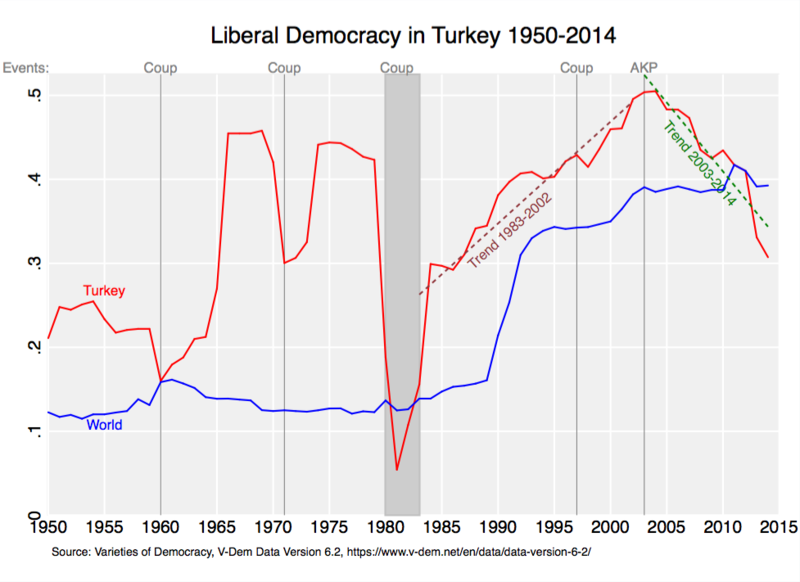 Below I plot the values of V-Dem’s Liberal Democracy Index (which runs from 0, the lowest level, to 1, the highest level) for Turkey in red as well as the average across the world in blue. Vertical lines in gray and accompanying text denotes four coups (1960, 1971, 1980, 1997) as well as the entering of AKP to government at the end of the year in 2002. The period between 1980-1982 is shaded in gray to separate it from the period following the renewal of popular elections in 1983. I overlay trend lines for the periods 1983-2002 and one for 2003-2014. “The egalitarian component holds that material and immaterial inequalities inhibit the actual exercise of formal rights and liberties; hence a more equal distribution of resources, education, and health across various groups should enhance political equality. All of these indices run from 0 (lowest) to 1 (highest). 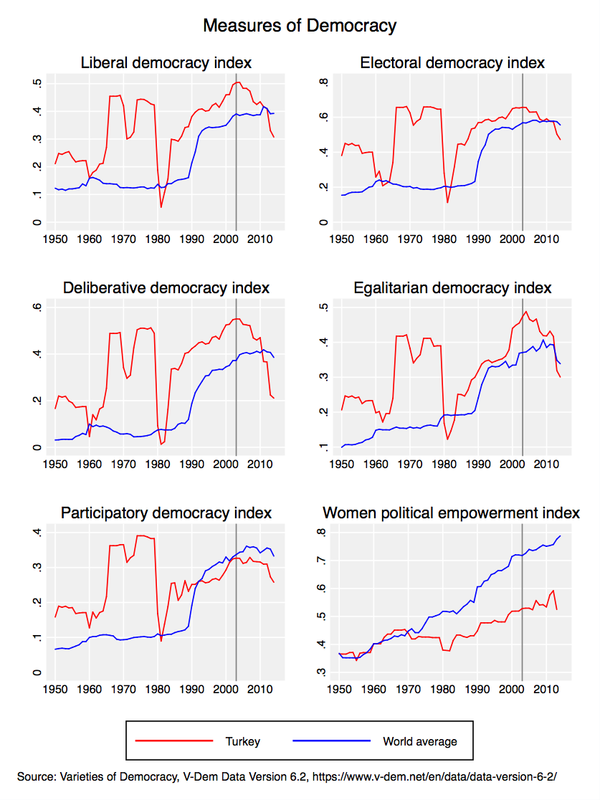 To various degrees, all democracy indices show a similar hump-shape around 2002, with the period leading up to this year exhibiting increasing values of democracy and the period afterwards exhibiting decreasing values. For the gender index, the post-2002 values are overall higher, shows no significant trend break from the period before. In relative terms, gender rights in Turkey is increasingly falling behind the world average. In this context, Turkey’s democratic decline after 2002 looks quite concerning. Whereas before 2002, Turkey was converging toward both Latin America and Europe. Afterwards, however, the institutional slide has brought Turkey to the point where it’s below the median African country and is converging toward Asia and the Middle East. Although Turkey was closer to the median European than the median Middle Eastern country back in 2002, a decade later it is quite the opposite. It is noteworthy that, despite the numerous constitutional amendments and legal packages passed under AKP, there is little to show for this in terms of democracy. If this wasn’t the work of an “enlightened advocate for enhancing democracy” (as the NYT editors initially considered Erdoğan) then what was it? An alternative explanation is that the last decade has had little to do with democracy but rather a shift in power from one set of autocratic elites to another. And the data seems to support this version of events more than the “would-be democrat gone rogue” one. Focusing on the period after the reinstatement of democracy in 1983, the post-coup, pre-AKP, era saw the cleanest elections in Turkey’s history according to V-Dem, and a subsequent decline following the coming to power of the AKP. 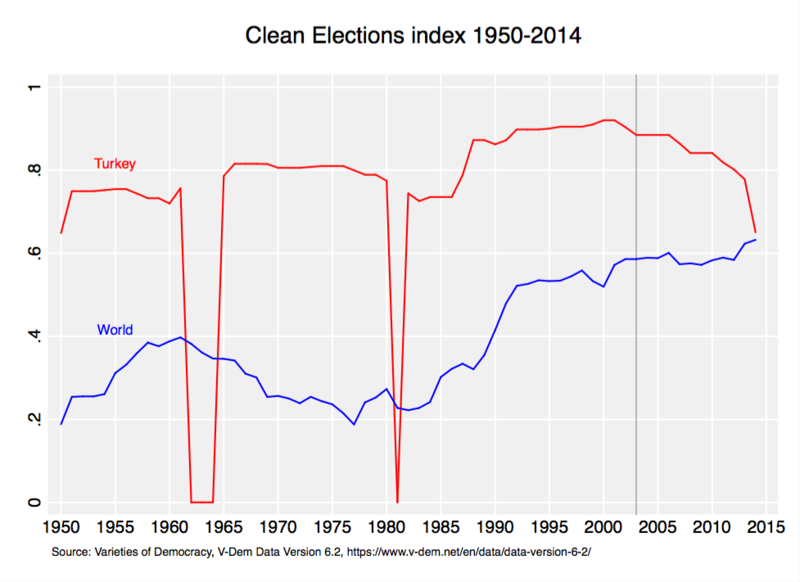 In 2014, not only has the state of clean elections in Turkey fallen to the point of the world average, but it has also reversed to where it’s value is indistinguishable from what it was in 1950. In short, feel free to pick your most (or should I say, least?) 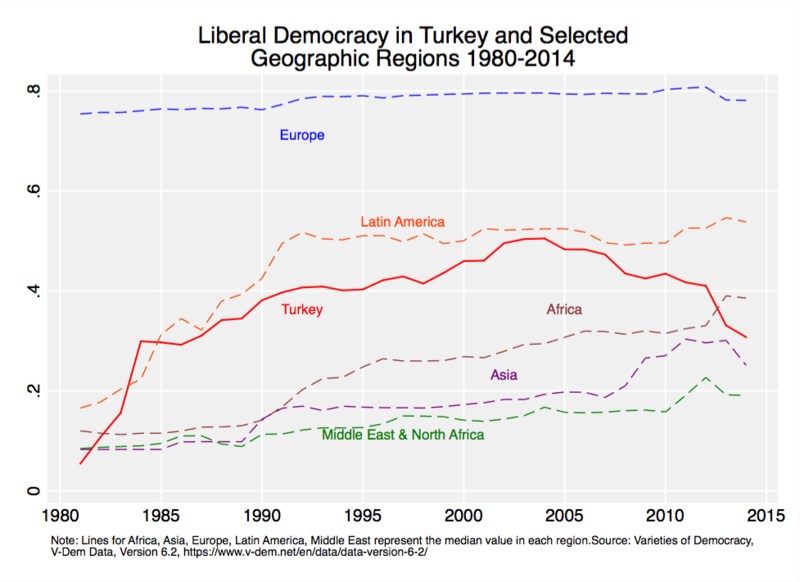 favorite takeaway from this: be it that the AKP has been twice as effective in reducing liberal democracy as its predecessors were in increasing it, or that Turkey is today significantly – at least in terms of political institutions – more Middle East and North Africa than Europe. But regardless, the talking point that the AKP has been promoting democracy for any durable period of its tenure, in any of the rigorous ways V-Dem measures it, is simply not supported by state-of-the-art data on democracy. In other words, it may be time to bury some talking points on Turkey.